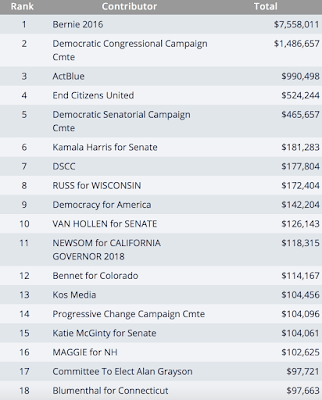 In terms of small donors on ActBlue, Bernie outraised the entire Democratic Party by 4 to 1. "End Citizens United" outraised the other "liberal" groups combined. Because ActBlue is a conduit, we file our own FEC reports and file every contribution in and back out. It’s a lot of data but it’s the most accurate. If you’re looking for data, I’d point you there. Open Secrets doesn’t pull from our reports but from the filed reports that candidates and committees file. They do need to report the processing fees that we collect so the numbers are usually in the right ballpark but can be messed up if a candidate makes a mistake on their filing, etc. If what you’re trying to figure out is how much Bernie raised, we don’t talk about candidate and committee numbers as a policy. But Bernie’s presidential committee publicly reported about $225 million being raised and he also was very public about nearly all of that coming via ActBlue in $27 chunks. It is true that he holds the title for being the biggest committee through ActBlue so far. 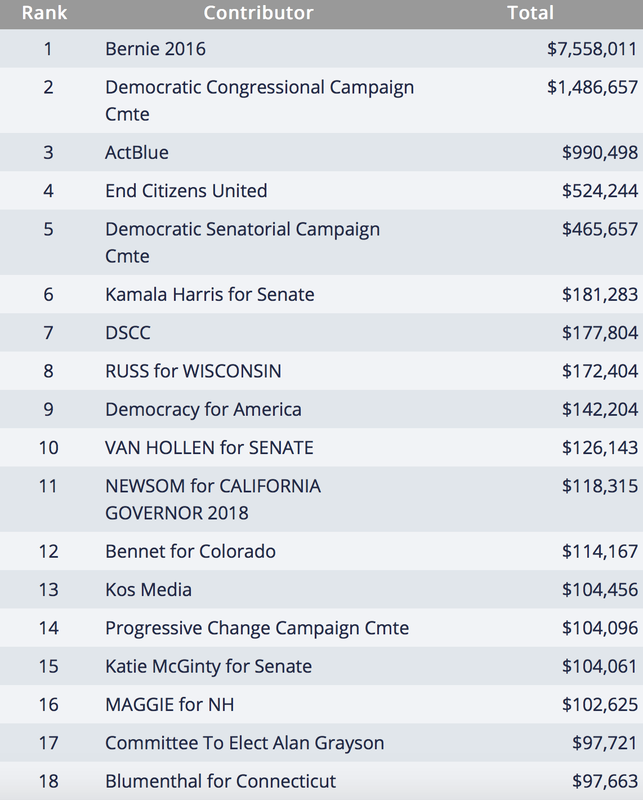 Not every committee uses ActBlue or small dollar donors for all their fundraising, so any numbers you’re pulling from us only relate to ActBlue and might not tell the whole fundraising story. If you’re looking for holistic campaign finance numbers, I’ll always suggest the FEC database as your best bet. FWIW, End Citizens United is the PAC affiliated with former DCCC folks. Huffington Post had a useful article about the organization in Feb. 2016. Don't know if it's the same people running the org. But Mothership Strategies did fundraising for Ossoff/Quist/Doug Jones (et al). They are the ones with the "world is ending / we're all going to lose" fundraising e-mails. "End Citizens United PAC launched with an aggressive strategy. Its founders were three former online fundraising specialists for the Democratic Congressional Campaign Committee who now run the consulting firm Mothership Strategies. 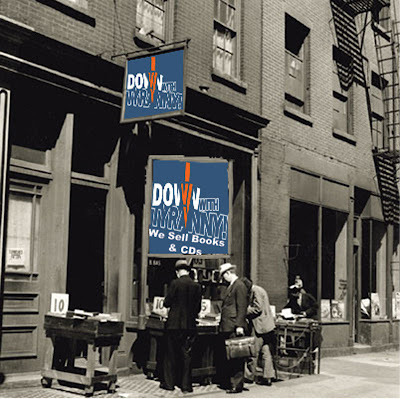 They imported their high-volume fundraising and list-building mindset to a cause that traditionally had drawn a few dedicated nonprofits. The political action committee sent out urgent email solicitations, as many as seven per day, with messages asking people to “rush a donation” and become a founding member of its effort to stop Republicans from chipping away at campaign finance laws. “If we want to restore our Democracy, we can’t back down. We need to act NOW,” one email read, requesting a minimum contribution of $5. The strategy was massively successful. In the last year, the group raised $11 million, mostly from small donations collected online. aren't 5 and 7 the same thing?